We first heard of the Mega Quarry years ago, while traveling in the Collingwood area. Local environmentalists were talking about a proposed quarry just to the south, a quarry larger than any ever dug in this country, so large it could swallow much of downtown Toronto and so deep that it would be taller than Niagara Falls. It was a nightmare vision – beyond the smog of thousands of trucks, across the polluted springs fed by poisoned aquifers, a devastating wound in the earth would extend past the horizon. On Sunday October 16th we hopped on a bus from Hamilton to Foodstock, organized by a new group called Stop the Mega Quarry-Hamilton. 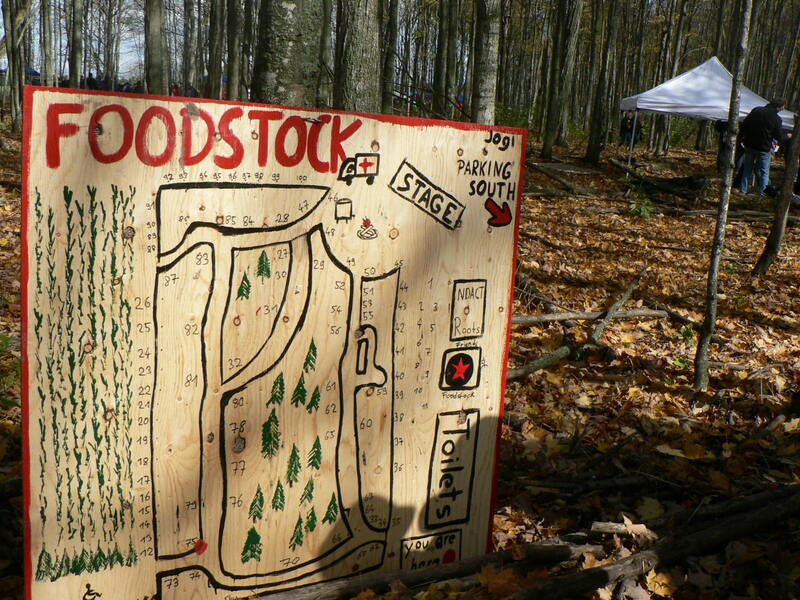 Foodstock was organized by the Canadian Chefs Congress and local activists fighting the quarry. Over a hundred chefs prepared food grown on the lands threatened by the quarry. Billed as a day to ‘stop the mega quarry’ and ‘save the land that feeds us’, by best estimates it attracted 28-30,000 people to one of the adjacent farmlands that has refused to sell. Our goal for the day was to meet and connect with other people who are organizing or who want to organize around stopping the Mega Quarry. This struggle could likely intensify in the coming years, and it’s useful to be able to build up a strong, regional network before the pressure is really on. Sam, a member of Stop the Mega Quarry-Hamilton, explained the group’s focus to be “bringing an anti-colonial analysis to the organizing against the quarry, and to emphasize the need for a watershed scale resistance not just to this particular quarry, but to the whole agregate industry and the runaway culture of endless growth that depends on it”. When seeking to defend a piece of land, one of our first responsibilities is to understand its history and our place in it – without that bigger picture, we risk making serious mistakes while rushing towards some seeming solution. 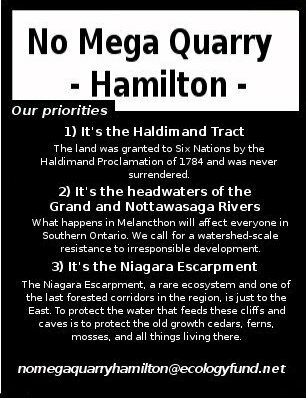 Sam explains what this has meant for No Mega Quarry-Hamilton : “In order to bring our strengths as a group to the process of resisting the quarry, we laid out three priorities our group is best suited to focus on, as you can see in the handbill we are sharing around today”. One of the key lessons from past land defense struggles is that getting people out onto the land is the single most powerful tool in building a movement in its defense. Foodstock casts its net wide, aiming both at political activists and at folks more interested in the local and slow food movements. Their goal seems to be to get as many people as possible out onto the land to directly experience the way they are dependent on it. The event itself had something quite magical about it – imagine walking along a muddy road through a dense woodlot of Sugar Maples all glowing yellow for the season, pausing to sample tasty bites of food from campfires around the way, while music filters in from all sides. However, once we had made our donation and entered the site, all political content vanished. There was no one leafleting the lineups, no one canvassing with a clipboard. There were interesting art pieces, but no posters discussing the effects of the quarry, no information tables among the food. Although the food was delicious, having come with the goal of networking, we felt at a bit of a loss. We heard from someone beside us in line that there were political tables out in the field, and that some local organizers would be speaking soon. We headed out towards the field and stage to find out more. As the afternoon advanced, the wind picked up sharply, and a cold steady rain began to fall. Mostly, everyone took this in stride and enjoyed themselves anyway. The political tables were more than fifty metres away from the large group gathered around the stage and further still from the food booths. Perhaps it was that weather was just cold enough to keep people away from these three booths way out in the middle of the field. Compared to the cheery crowdedness of the rest of the festival, these three booths looked quite lonely. There were two organizations promoting local food, Sustain Ontario and Slow Food Ontario, and one promoting the organizing against the quarry, the North Dufferin Agricultural and Community Taskforce (NDACT). 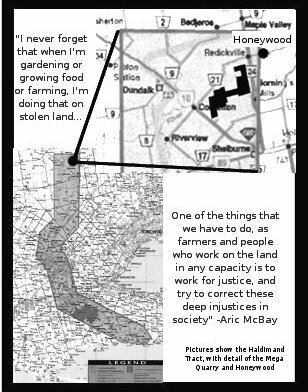 A map showing that the proposed Mega Quarry is inside the Haldimand Tract, land given to Six Nations that was never surrendered. this will establish a precedent for anti-quarry struggles elsewhere in the province. Although the organizers are extremely knowledgeable and keen to meet other activists, the tables were mostly geared towards selling Foodstock merchandise rather than educating or engaging the people in attendance. It’s clear that the purpose of Foodstock was to raise money. The amount of money needed to successfully intervene in an ecological assessment or an Ontario Municipal Board hearing is unbelievably large. It typically takes all the energy that community groups have to raise these sums, and the gains at the end are seldom more that some token “greening” concessions from the developers. However, there have been enough important successes and crucial delays gained through this route that we fully support communities pursuing it if they want to. At the end of the day, we heard Sarah Harmer play the anti-quarry classic, Escarpment Blues, before running through the mud to catch the bus home. We met a few more volunteers from NDACT on the way out, and they seemed confident that in this one day they’d made enough money to battle this quarry through the legal system for some time to come. This is an important success, but we can’t help but feel that there was a missed opportunity. There were 30,000 people there that day, and little effort seems to have been made to engage them about the issue. To be clear, we do not offer this criticism to put this movement down. Several people we spoke with rightly noticed the absence of an anti-colonial analysis (whose home and native land? ), and criticized the way the event catered mostly to consuming cuisine. The community there clearly cares deeply about protecting the land they live on. They are leading this struggle right now, but they can only benefit from working with other groups with different perspectives. When we notice organizing around an important goal like this lacking an analysis that we value, it is a reason to engage with that organizing, not distance ourselves from it. After all, almost everyone living in this great watershed feels something unsettling about the idea of the Mega Quarry poisoning the many lakes and rivers which flow north and south from the headwaters region. Foodstock brought thirty thousand people out to experience this region for themselves, and clearly demonstrated that this is the land that feeds us. There is a powerful significance to this simple fact. Even without much additional messaging, Foodstock made our connection to this land clear and we believe it has laid solid groundwork for a growing opposition to the Mega Quarry. We will continue to share updates on this story both on this blog and on Facebook as knowingtheland isresistance. Join in the conversation!